Ibrox Noise: Rangers call in extra security - Gerrard announcement due? Rangers call in extra security - Gerrard announcement due? According to Ibrox Noise sources extra police security has been called for tomorrow, with a press conference said to be due at Ibrox. The press will be briefed in the morning accordingly. 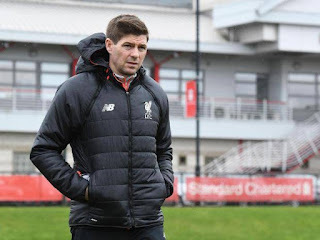 Normally Rangers’ pre-match pressers are conducted at Auchenhowie, but with the Steven Gerrard situation reaching fever pitch and the 37-year old presently in Glasgow negotiating, it is not hard to reach the conclusion over what this particular conference will be about. Naturally, it could just be extra detail being called in and a traditional pre-match presser being held in Govan, but it is far from inconceivable that something Gerrard-related is imminent, although we cannot confirm that it is the case. Whatever happens tomorrow, we must also not forget we have a match to play on Saturday, and it is absolutely critical to take the full three points – with 9 points left to play for, second place is not out of reach. But if Gerrard is announced tomorrow, his presence on Saturday at Ibrox would sure help inspire the crowd and the players. Said on here many times that Rossiter's ability has grown disproportionately to his skill set during his injury absence. I suspect if he ever gets fit many Rangers fans are going to be disappointed with him. Nonsense,dunno where you're getting that from. Everytime Rossiter plays he stands out(albeit in the development squad). He has real quality and a fit Jordan Rossiter is head and shoulders over any midfielder in this country. Still a youngster.Give him a full season under his belt and he'll be in that he mould of a young Barry Ferguson..easily! William I will be delighted to be proven wrong! We shall see. News going around social media is that Gerrard has said thanks but no thanks. Disappointing really. If that were the case I find it hard to believe that there would be a need for extra security! Great now let it be our time has come we are back. calm down guys, we don't even know he'll be a success. Let's not get carried away, it's not like he's been a successful manager. Iv'e got big reservations about this appointment anyway, we cant afford to get this new manager decision wrong again. One things for sure the cold war will start today never think that Selltic will just carry on as they are they are watching what the size of the Pot of Gold is for SG what he is getting his hands on,BR will not be going anywhere now he will stay and try and turn SG in to a Murty he better be ready for what comes his way,its going be a good watch i just hope we come out on top in the games that matter and we do not end up sacking SG this is it me thinks we put everything we have on SG stopping 10 we better not fail. U missed a Bouncy out!! Gerrard! - The new Souness! The name to attract the best talent.